When I was recently compiling my list of Top 10 Spring Fragrances 2013 (a very subjective guide to what I'm wearing right now and will be wearing for next month or two), I realized that we've never posted a review of Lostmarc'h Iroaz; so, better late than never. Iroaz was released in 2008, and its name comes from the Breton word for "rose." 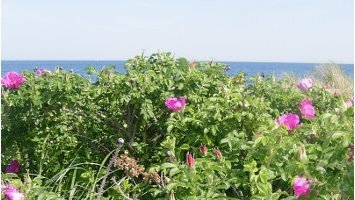 Lostmarc'h describes the fragrance as "a delicate yet wild marine rose. Rose absolute refreshed by marine aromas and red berries. The subtle and profound aroma of orris forges the link and harmonises the whole." Iroaz is one of those fragrances that appealed to me when I first heard about it, and I have no idea why I took four years or more to try it out and then purchase a bottle. Iroaz has never had the fan following of Lostmarc'h's Lann Ael, which puzzles me, because it's a well-crafted fragrance that should appeal to a range of tastes. When I sniff Iroaz from the bottle, I notice a lemony citrus note. But when I spray it on my skin, it's an interesting blend of aquatic and peppery notes — and don't let the word "aquatic" scare you, because Iroaz definitely suggests sea air rather than swimming pool fumes. It has a slightly salty aspect, which is another aspect of the "marine" mood, and if it's a day at the shore, there are also a few passing clouds in the sky. This whole phase of the fragrance feels true to nature and pleasingly androgynous. Iroaz's heart is softer and more floral than its coastal opening; this is the part with the beach roses and a dusky, earthy note, perhaps some vetiver in addition to the orris root. Iroaz turns more feminine after an hour or two of wearing, but it's still not a "girly" rose fragrance. It evokes driftwood and a few strands of seaweed as well as flower petals, so you don't need to love rose fragrances to wear Iroaz; in fact, if you're looking for a real springtime rose scent, you'd do better with something like Diptyque Eau Rose or Parfums DelRae Coup de Foudre. Instead, Iroaz could be categorized with Les Parfums de Rosine Ecume de Rose (although it's more transparent and less ambery) or Dawn Spencer Hurwitz's Beach Roses (which includes notes of rose with sandalwood, palmarosa, lemon, and lily). One note that never appears in Iroaz when I wear it, despite its mention in the Lostmarc'h description: "red berries." That's fine, actually. Iroaz has average staying power for an Eau de Toilette. I wish it lasted longer on my skin, but this lightness also means that Iroaz is nearly impossible to over-apply (making it suitable for daytime and office-wear) and that it's easy to wear for hot summer weather as well as balmy spring days. 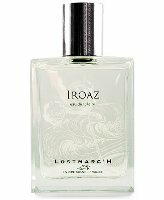 Lostmarc'h Iroaz is available as 100 ml ($85) Eau de Toilette. For purchasing information, see the listing for Lostmarc'h under Perfume Houses. Note: top image courtesy of the author. I usually run the other way when I see marine or aquatic notes listed, but I came across a sample of this and liked it quite a lot. I should try it again now that it’s getting warmer—thanks for the reminder! Janice, I feel the same way about most marine and aquatic fragrances — but this one is an exception! It’s not a “clean” marine fragrance, thanks to the rose and the sheer earthy notes. Miss Kitty, you know, I just came up with that analogy, and I’m glad you like it. Really, if all the so-called “marine” fragrances really smelled like the ocean, they wouldn’t be so bad! but they’re so fake and harsh, they really do remind me more of swimming pools. Hence all those bright blue juices…? Thanks for the review. I love the house of Lostmarch. I can’t believe I’ve never tried Iroaz. Lostmarch L’eau de L’Hermine was one of my first full bottle purchases and I also love Lann-Ael. I’ve debated a bottle of Aod for a long time (but I’m still enjoying my decant). The only one I’m not entirely sold on is Ael-Mat – seems to have a bit of a sour note on my skin. I will add Iroaz to my “to try” list! Hi Jessica. I love Iroaz and haven’t been able to get it out of my mind since sampling a vial of it many months ago. It’s hard to justify buying it outright — in addition to all my other scents, I already have decants of Coup de Foudre and Un Zeste d’Une Rose (a favorite Rosine). But I think Iroaz would be really great for summer. I am often drawn to this kind of rose scent that’s lifted by citrus and other “airy” notes. Thanks for the review and for bringing it to the attention of NST readers. I very much agree that it’s worth sampling. Well, then, my work is finished here. For the time being, at least. The first perfume I smelled on my first trip to Paris was Iroaz. So glad I purchased a bottle b/c every time I open it I think of that lovely spring time in the city of lights. Oops, this is starting to sound like a perfume ad. Sullapelle, that’s a wonderful memory, worth holding onto (and worth sharing!). Lostmarc’h is a house I’ve been curious about for some time, so thanks for this lovely review, Jessica – it’s given me the push I needed to get on with ordering their sample box!